Developments in Italy and the growing estrangement between the US and Europe, not just over trade, but Russia and Iran as well, are overshadowing the conclusion of the third assistance program for Greece. The end like the beginning is a bit rolling, in the sense that the formal program ends this month, but the final payment is expected in August. And even, then, it will likely come under close scrutiny to ensure that it does not backtrack on the reforms. Even at this late date, the pivotal issue of the sustainability of Greece's debt has not been resolved. The macro-picture has improved, and the fiscal and current account imbalances have been addressed or are being addressed. The round of pension cuts that are to be implemented next year sparked a general strike and protests against the government in May. Europe has been of two minds of the IMF's role. Initially, it was rejected. Europe could handle European problems. Then it was recognized that the IMF had critical technical skills and money. However, more recently, there has been a parting of the ways over the size and scope fo debt relief for Greece. The IMF argues that Greece's debt is not sustainable. Some relief is necessary, but the IMF says it won't be on its accounts, which pushes more of the burden on the other official creditors, the ECB, and EFSF/ESM. And they balk. This, in turn, aggravates a delicate situation. As is well appreciated now, the bulk of the funds Greece got during its three aid programs allowed Greece to service its debt, the vast majority of which is in official hands. When the private sector was forced to take a haircut on Greek debt, the official sector did not. This is where the fundamental flaw lies. The debt restructuring was not permitted to be sufficient to put Greece on stable footing. If Greece is going to service these debts now without relying on such "aid," it needs to access the capital markets. Its access to the capital markets is fragile. 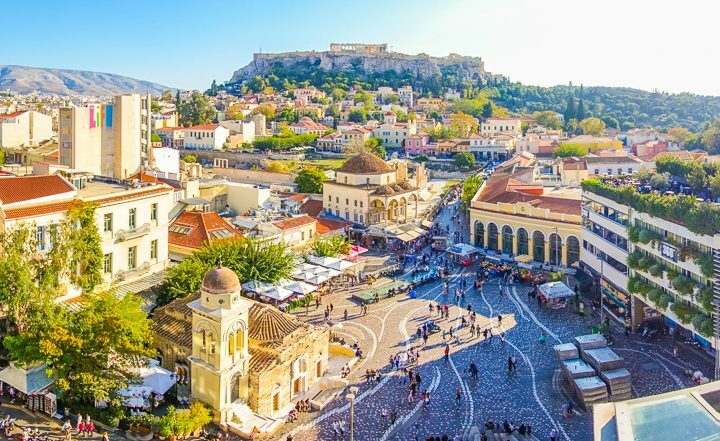 If there is no meaningful easing of Greece's debt burden, it is not clear that the private sector, outside of Greek banks, pensions, and financial institutions, will want to commit to a situation that the IMF argued is not sustainable. Disruptions to the capital markets, due to no fault of Greece's, such as that seems likely to transpire as the new Italian government takes on the European Commission over campaign promises that could cost around 125 bln euros in the first year. The ECB and the Greek Central Bank want something like a precautionary line of credit when the official program ends, but the Greek government sees it as too close to a fourth aid program. Politically it is not acceptable, though somehow projecting a primary budget surplus of 5.2% of GDP will be tolerable in fact. The Greek government prefers a cash buffer of around 20 bln euros for the next 18-24 months, but it is not clear how that can be built. It is almost 10% of GDP. By many measures, the Greek economy has turned a corner. Growth in Q1 was 2.3% at an annualized rate, the best in a decade, and the fifth consecutive quarter of growth. The economy expanded 0.8% on the quarter, edging above Spain's 0.7% performance. Exports rose 9.5% year-over-year, while imports, still suffering from soft domestic demand, are off by 2.7%. More troubling was the 8.3% decline in fixed capital investment, which may reflect the lack of long-term conviction. There is reportedly discussion over the possibility of providing some relief by linking interest rate to Greece's GDP. The stronger the growth, the higher the interest rate in some fashion. In principle, GDP-linked debt is interesting, and we suspect that it is a place where Shariah-compliant financing and traditional western finance can find common ground. It also can align creditor and debtor interests. However, a challenge that Greece faces, which makes other make other problems more acute, is the stock of debt not the servicing of it. If one thinks that redenomination risk is minimal, are Greek 10-year bonds, presently yielding 4.5% attractive? We suspect that yields are going to trend higher and would not be surprised to see something closer to 6% over the next 12-18 months. Although there is said to be much uncertainty over ECB policy, we think it is fairly clear. The ECB will most likely finish its buying in Q4 18, as it tapers further after September. Our base case was for a hike around the middle of next year. The market had pushed it from March 2019 to Q4 2019 and now back to mid-year.